NCAA Picks at NHL Draft Hit 11-Year High - College Hockey, Inc.
Western Michigan incoming freshman Mattias Samuelsson was the first pick of the second round to begin Saturday’s portion of the NHL Draft. 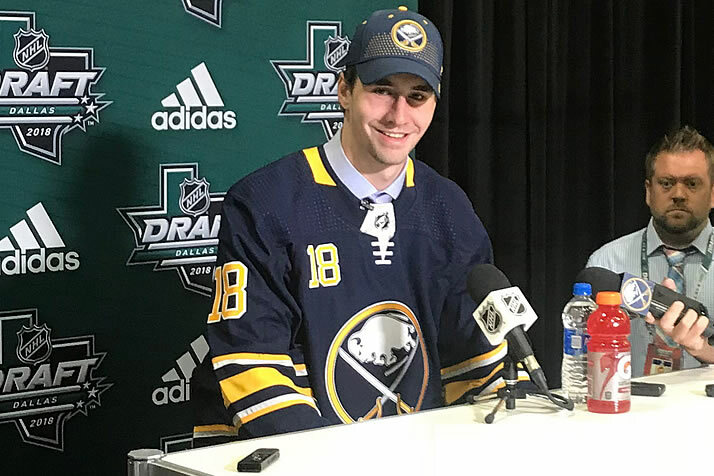 The 2018 NHL Draft featured 67 NCAA players and recruits selected, the most since 2007. More than half of all NCAA schools (32 of 60) had a representative chosen in the seven-round, two-day event held Friday and Saturday at the American Airlines Center in Dallas. Seven first-round picks on Friday night led the 67 NCAA selections, which were seven more than last season and the most since 75 were taken in 2007. Twenty-seven of the 31 NHL teams chose at least one college player in the draft, with the Ottawa Senators leading all teams with seven NCAA selections. Nine of the players selected spent 2017-18 in NCAA hockey, led by first-round picks Brady Tkachuk (No. 4 overall) and Quinn Hughes (No. 7). Boston University, Denver, North Dakota, Providence and Wisconsin each had four representatives selected to lead all schools. Former college hockey players made up 32% of all NHL players this season.